Posted November 18th, 2015 by ijan & category NEWS & OPINIONS. Paris. Beirut. Baghdad. Yola & Kano. These names of cities are again this week the names of massacres. The International Jewish Anti-Zionist Network condemns without question the horrible crimes perpetrated in the last days, the ones the mass media has made visible, as in France’s capital, and the ones it has refused to see in the capitals of Lebanon and Iraq as well as two cities in Nigeria, and as ever, in Palestine. Posted April 25th, 2015 by ijan & category Backlash Defense, NEWS & OPINIONS. IJAN condemns SCR 35, and rejects the notion that the bill comes out of any genuine commitment to the struggle against racism. Although the language of the bill makes it seem as though it is taking a stand against antisemitism and racism, the truth of the matter is that SCR 35 is a Trojan Horse for Zionism. Posted April 20th, 2015 by ijan & category Backlash Defense, NEWS & OPINIONS. IJAN) condemns the US government’s decision to sentence Rasmea Odeh, Palestinian organizer and community leader, to 18 months in prison for allegedly lying on her immigration and US citizenship paperwork. Posted March 2nd, 2015 by ijan & category NEWS & OPINIONS, Uncategorized. The International Jewish Anti-Zionist Network (IJAN) expresses its profound sympathy and grief over the brutal murder of three Muslim American students at the University of North Carolina in Chapel Hill on February 10, 2015. We send our heartfelt condolences to the loved ones of the victims of this heinous crime. 19-year-old Razan Muhammed Abu-Salha, 21-year-old Yusor Muhammed Abu-Salha, and 23 year-old Deah Shaddy Barakat were all murdered in cold blood, “execution-style,” as the father of the two women said. Posted February 17th, 2015 by ijan & category NEWS & OPINIONS, Uncategorized. IJAN is glad to present its solidarity with the Platform Against Islamophobia and its promotion of a Strategic Plan and Comprehensive Law against Hate Crimes, as well as its implementation at the national and state levels. We seek to add our network to your list of supporters. Posted January 27th, 2015 by ijan & category Never Again for Anyone, NEWS & OPINIONS, Uncategorized. On the anniversary of the liberation of Auschwitz, we honor Hajo Meyer’s life and his commitment to the liberation of all people suffering dehumanization. Posted January 14th, 2015 by Rio & category NEWS & OPINIONS. Posted December 11th, 2014 by ijan & category Israel's Worldwide Role in Repression, NEWS & OPINIONS. In the wake of the decisions not to indict officers Darren Wilson or Daniel Pantaleo for murdering Michael Brown and Eric Garner, the Anti-Defamation League (ADL) – a Jewish organization purportedly founded to fight racism and anti-Semitism – has revealed itself to be once again standing on the wrong side of history. Not only did the ADL urge “calm” of protestors in the face of righteous anger against the state murder of Black people across the United States, they also stood with the St Louis grand jury: “we respect the grand jury’s integrity and their commitment to meeting the heavy responsibility thrust upon them.” And, adding insult to injury, the ADL praised the NYPD despite the shameful and brutal murder of Eric Garner and the midst of their violent repression of protestors. Posted September 17th, 2014 by ijan & category Never Again for Anyone, NEWS & OPINIONS. Below are two editorials from signatories to the survivors’ and descendants’ letter submitted to The Jewish Daily Forward in response to Alvin Rosenfeld’s op-ed which was full of ad hominem attacks on the signers. Neither op-ed was published nor did either author receive a response from The Forward. First is an op-ed by signatory Jesse Strauss and second one from Bruce Ballin. Click here to view a press release about The Forward’s refusal to provide the signers an opportunity to defend themselves agains Rosenfeld’s attack. Posted September 1st, 2014 by ijan & category Israel's Worldwide Role in Repression, NEWS & OPINIONS. 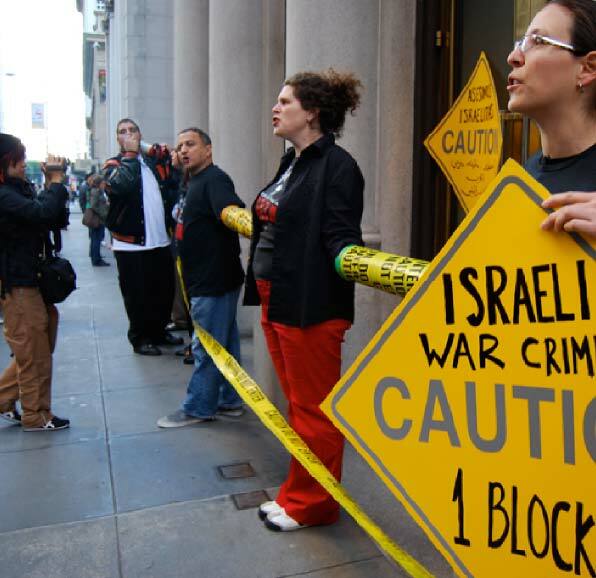 IJAN participated in the Stop Urban Shield Coalition, an important campaign that reflects our work on Israel’s Worldwide Role in Repression and particularly the collaboration between the Israeli military and police forces across the United States. Below is the coalition’s statement upon achieving two major victories.